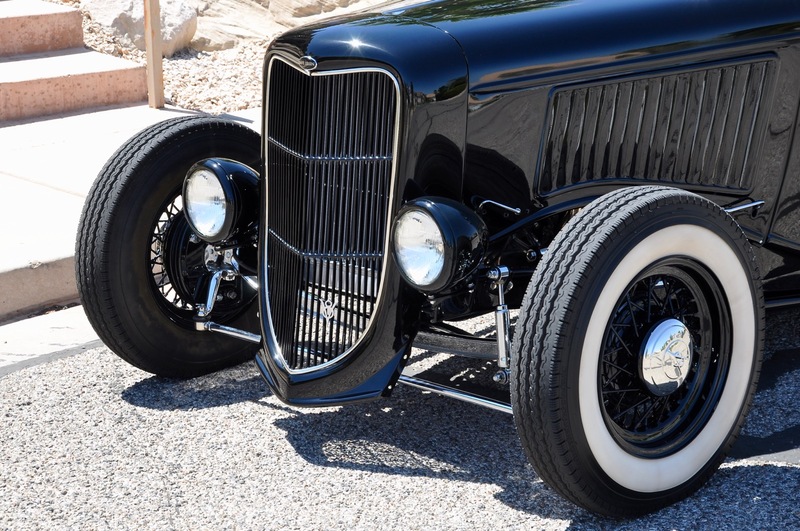 In a world chock full of cookie cutter & wannabe Hot Rods, it is so refreshing to come across a super high quality build where no corners were cut, and no stone was left unturned. 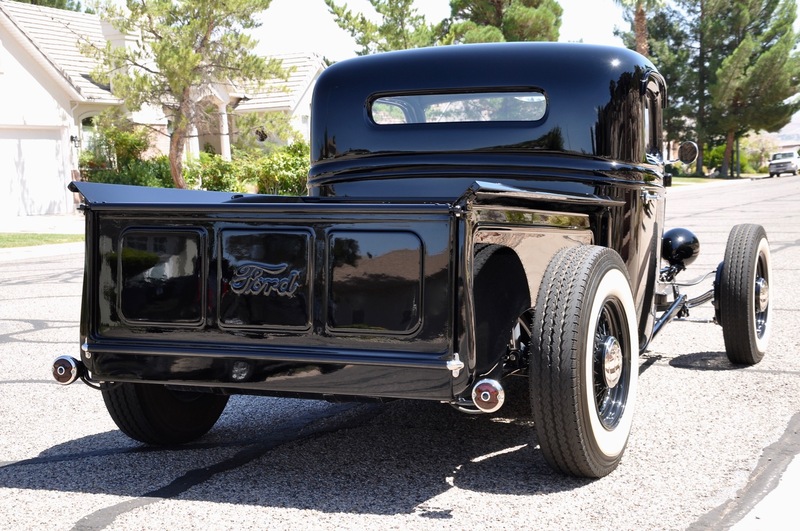 ‘Red Hills Rods & Classics’ is proud to offer you this absolutely stunning all-steel 1936 Ford Hot Rod Pickup! 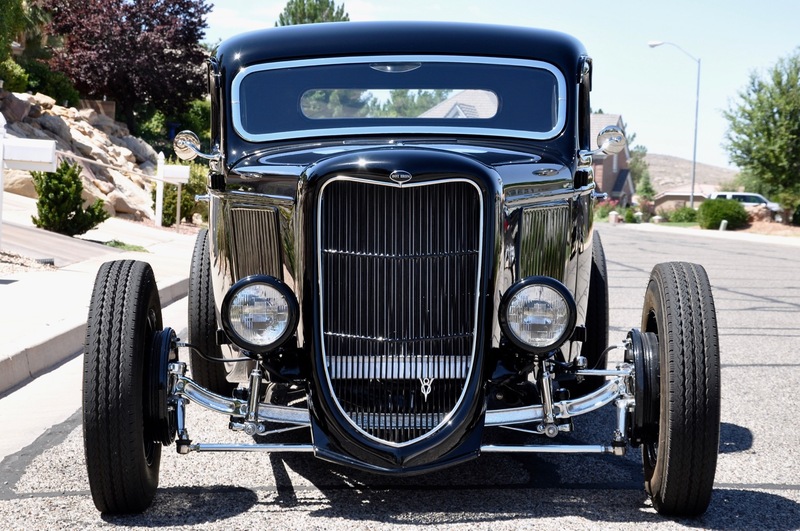 This spectacular vehicle is one of several being offered from a private collection in Northern Utah, and after nearly 16 years of selling high-end classic cars, muscle cars, & Hot Rods, I can safely say that these vehicles are some of the absolute best that I have had the honor of representing. 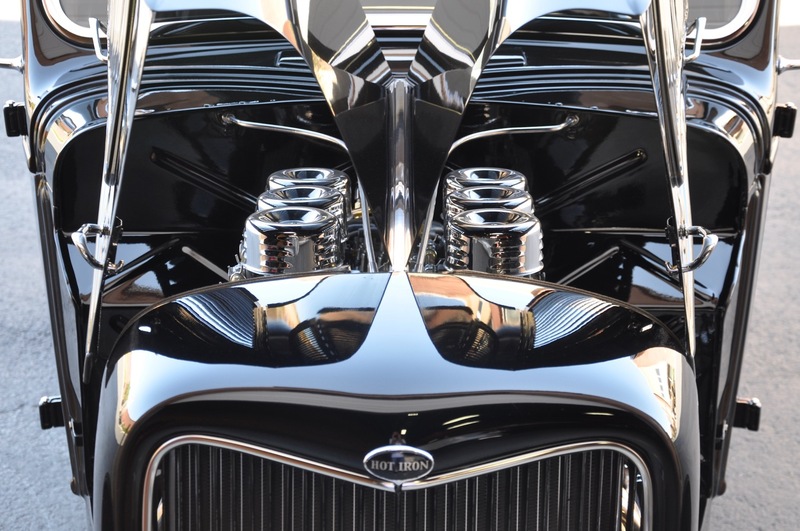 This no-expense spared build is the result of countless man-hours spent to create a showpiece that any high-end collector would be proud to put into their collection. 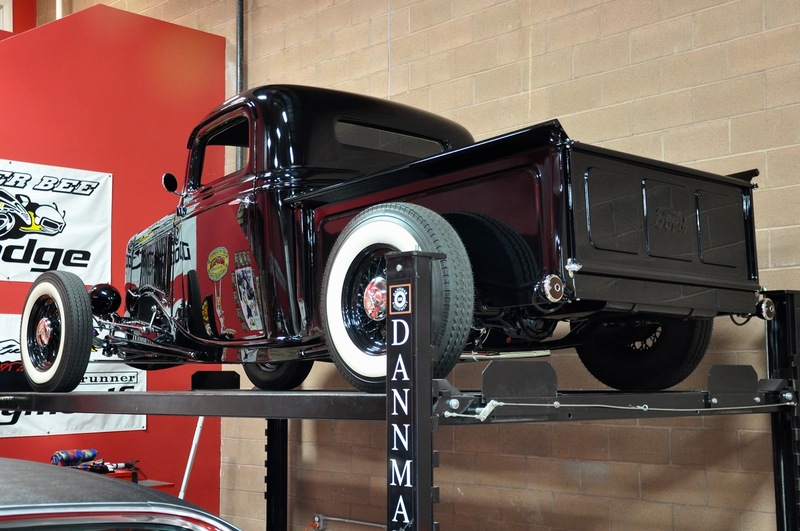 This show truck has less than 50 test-miles driven since the completion of the build. 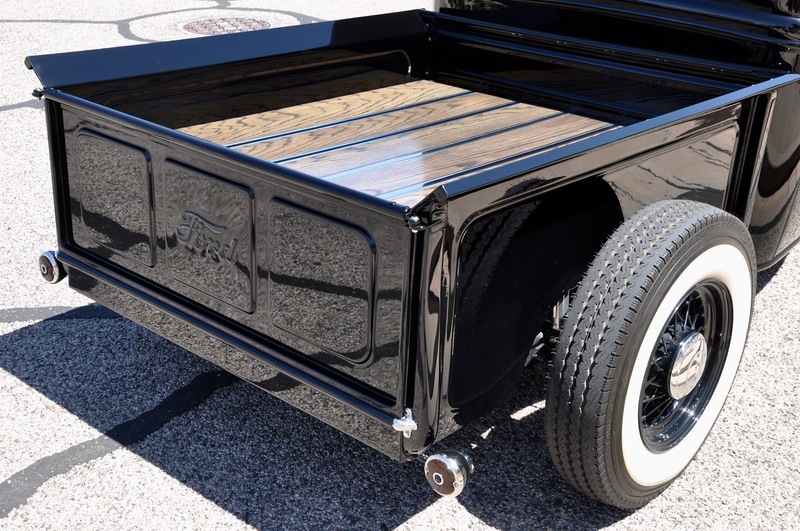 It all started w/ an original 1936 Henry Ford cab that was chopped just right, sitting on top of a custom hand-built 1936 Ford frame, w/ a hand-built bed including a 1936 Ford tailgate & bed pockets. 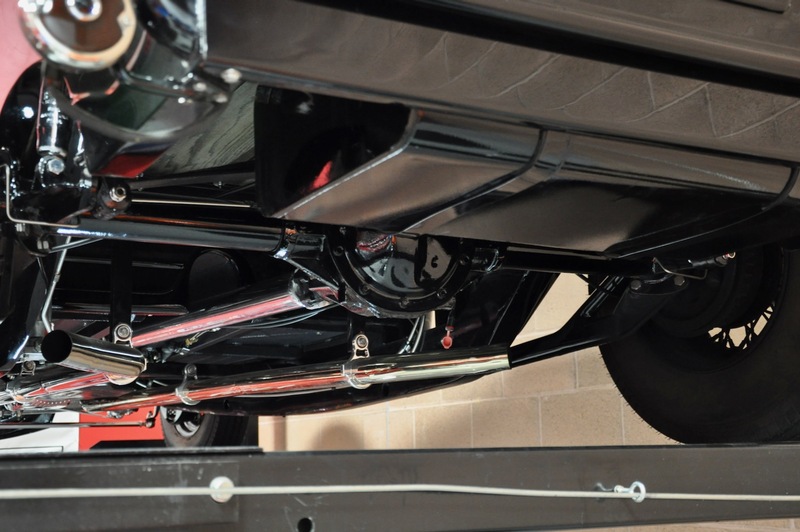 The bodywork is simply outstanding throughout w/ a precise fit that only comes from untold hours of attention. 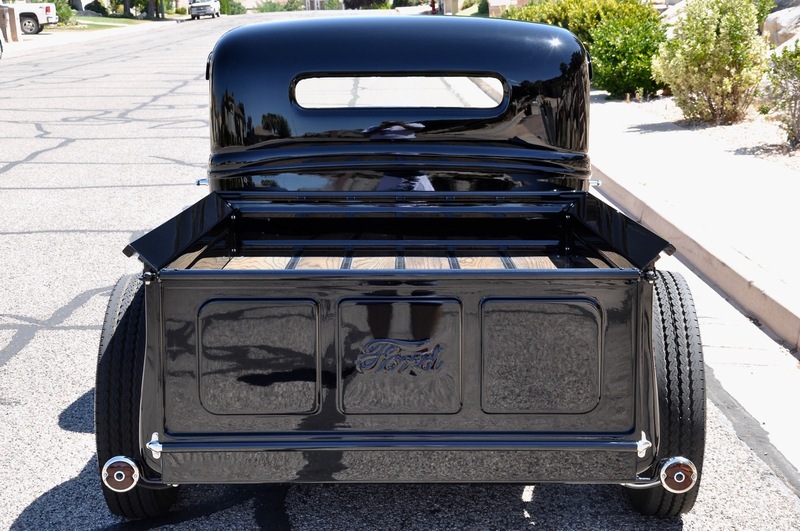 The gloss black paint is ultra-deep and has a mirror-like finish, w/ a super glossy shine that is second to none. 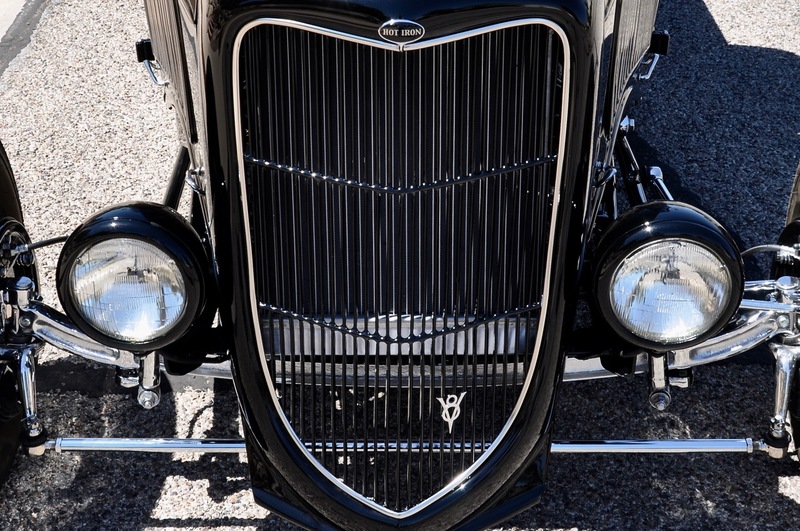 The headlight cups were painted gloss black as well, which looks fantastic. 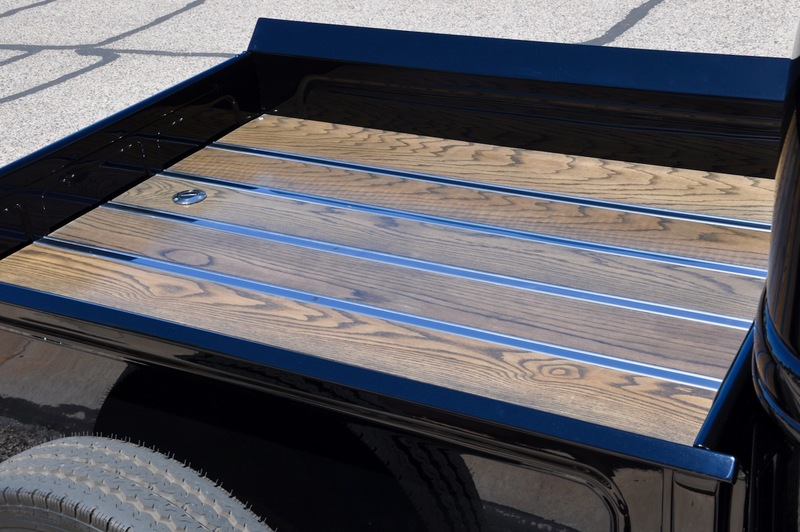 The bed is finished in a beautiful oak wood w/ stainless steel strips, which really adds a touch of class. 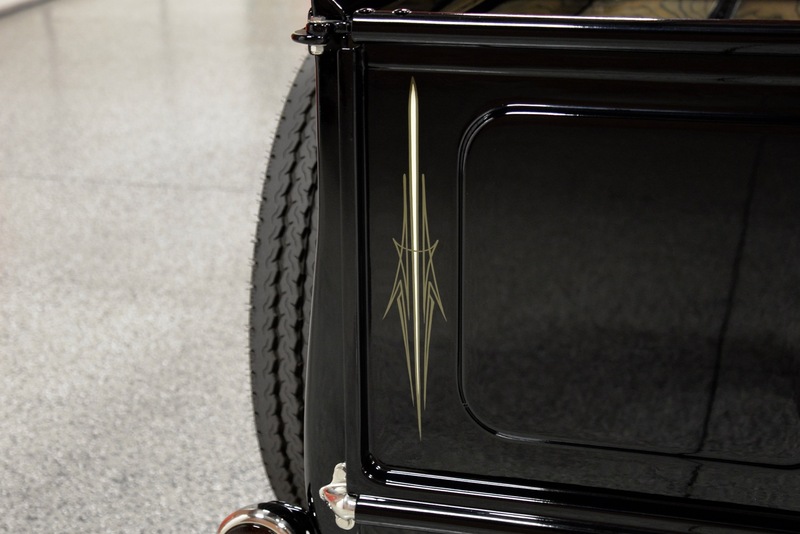 The decision was made to add a few old-school pinstripes, which you can see quite well in the indoor photos. 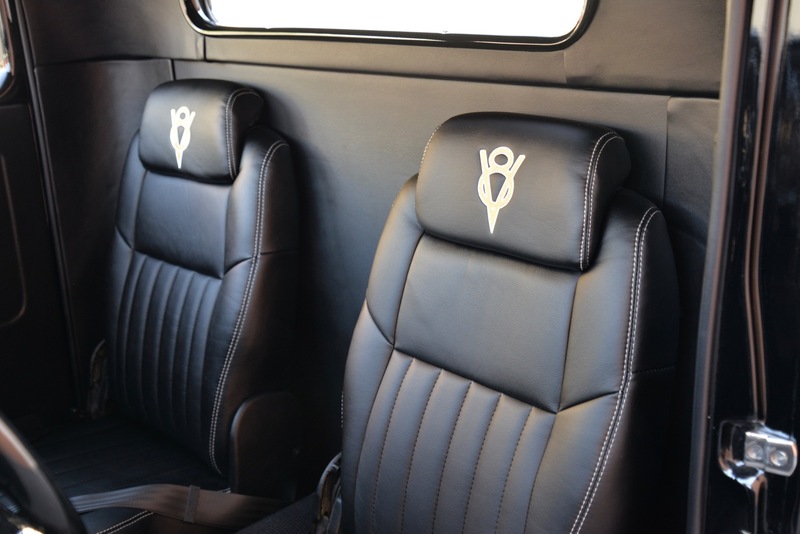 I think they added just the right touch and came out great. 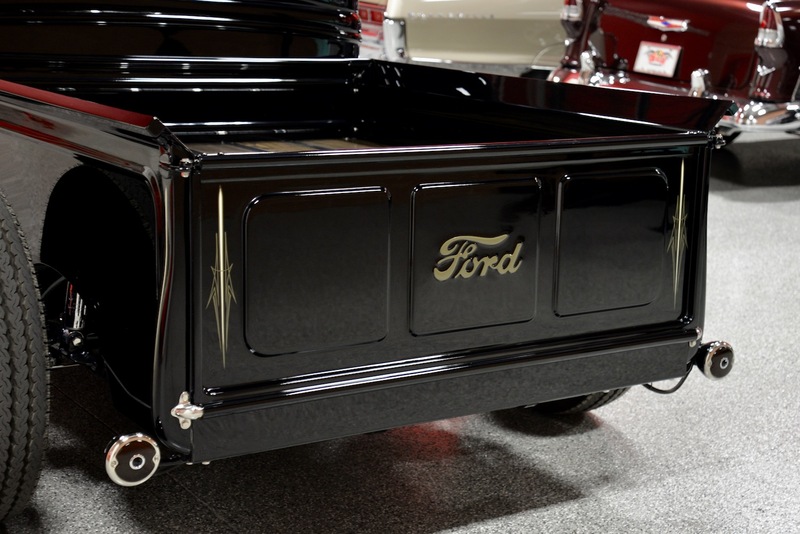 This gorgeous little pickup has the perfect stance, which is of utmost importance, and sits on powder-coated 16” wire-wheels w/ Ford script center caps, wrapped w/ new Coker Classic white-wall tires. 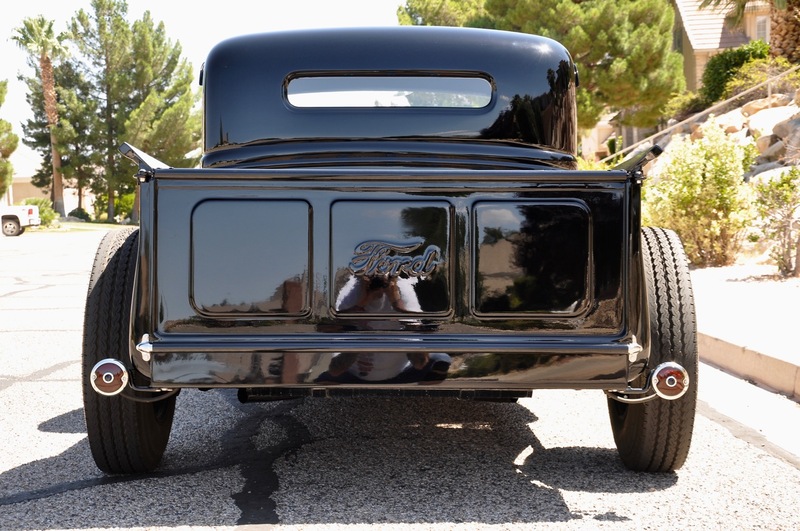 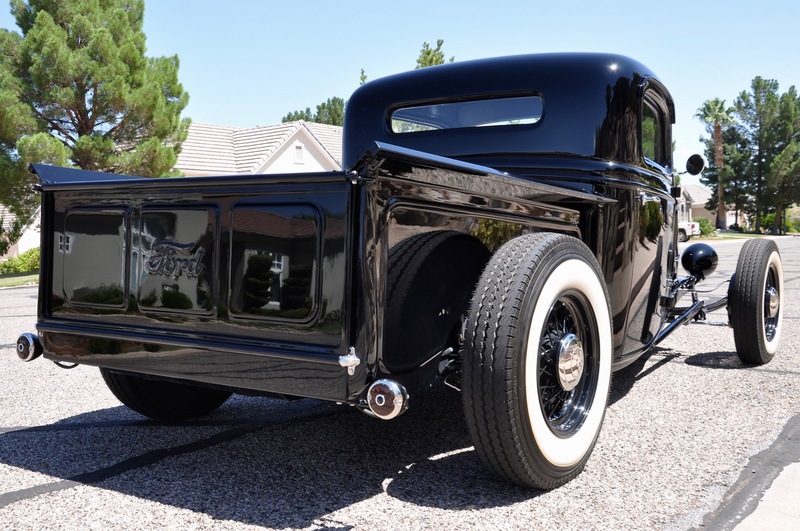 You can walk around this Chopped ’36 Ford Pickup a hundred times and you will never find a bad angle! 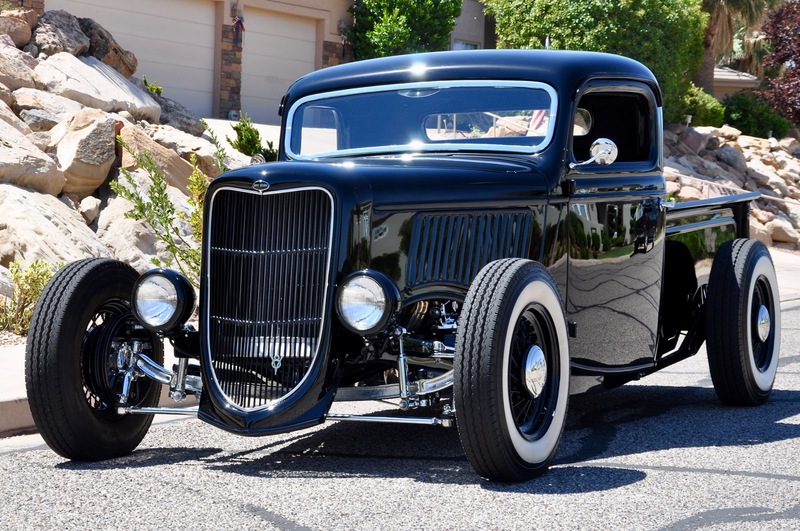 She is low, lean & mean! 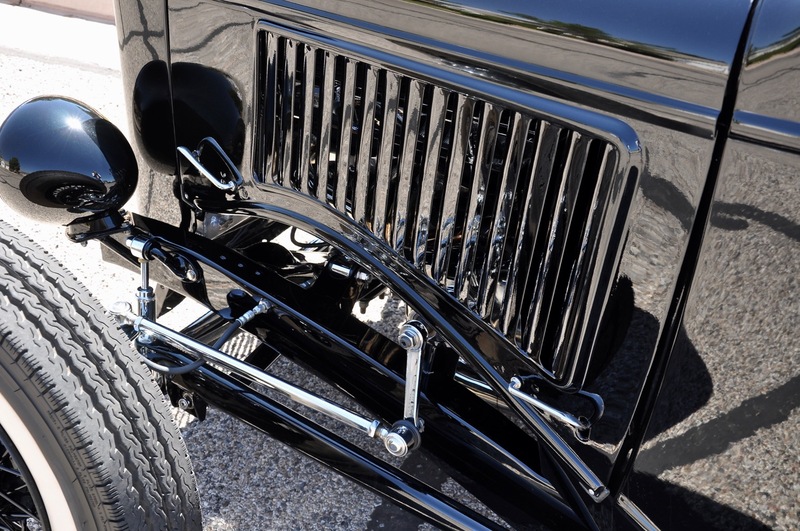 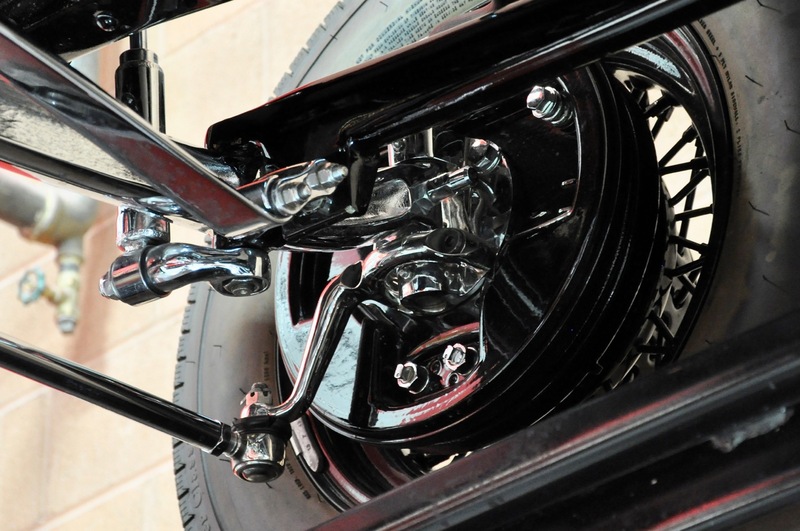 The undercarriage is highly detailed from front to back featuring a Superbell 4” dropped axle up front, split wishbones front & rear, buggy springs, and 1940 Ford drum brakes (please look closely at the undercarriage photos to see how nicely everything was done). 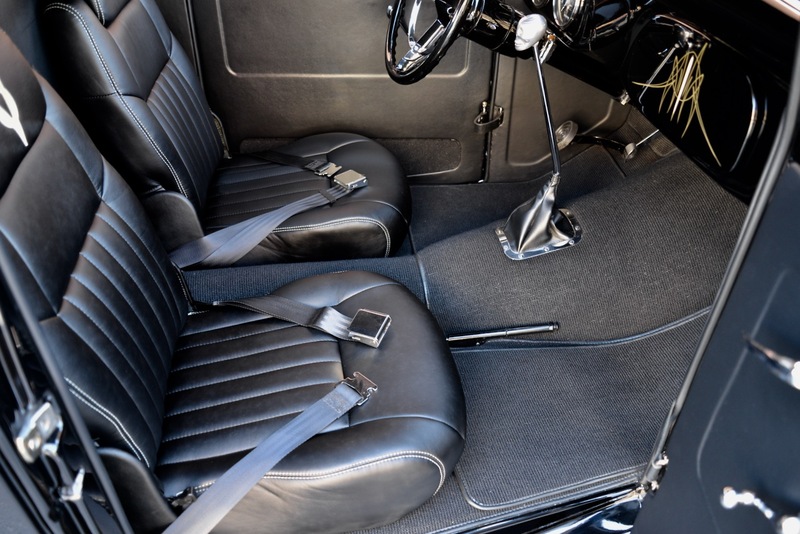 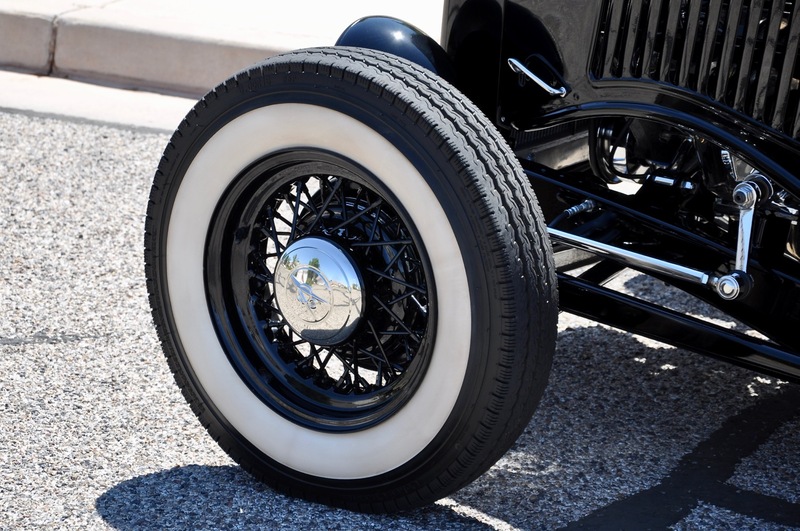 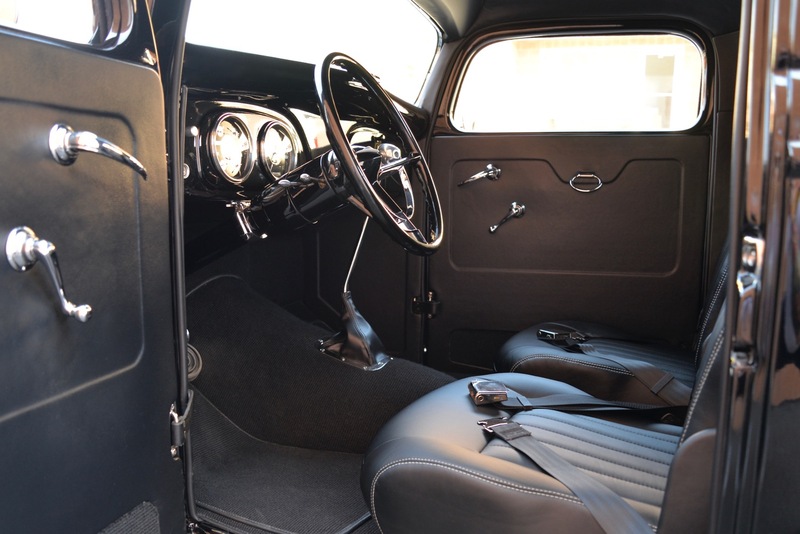 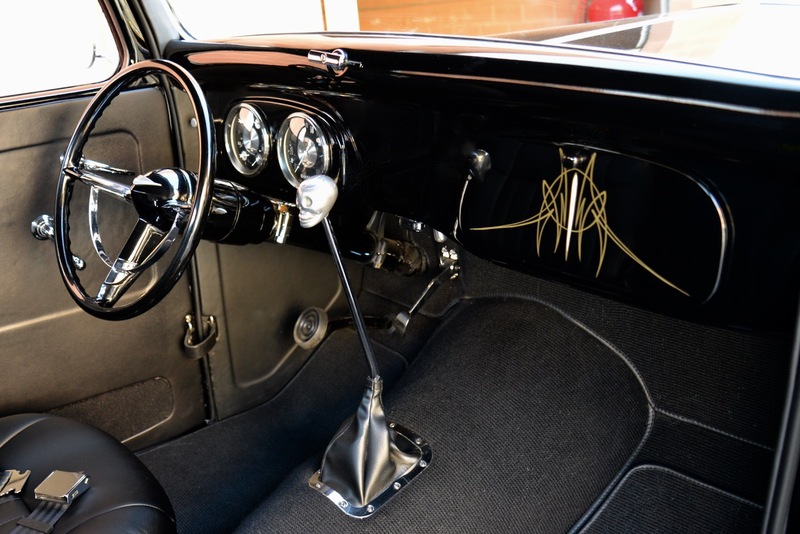 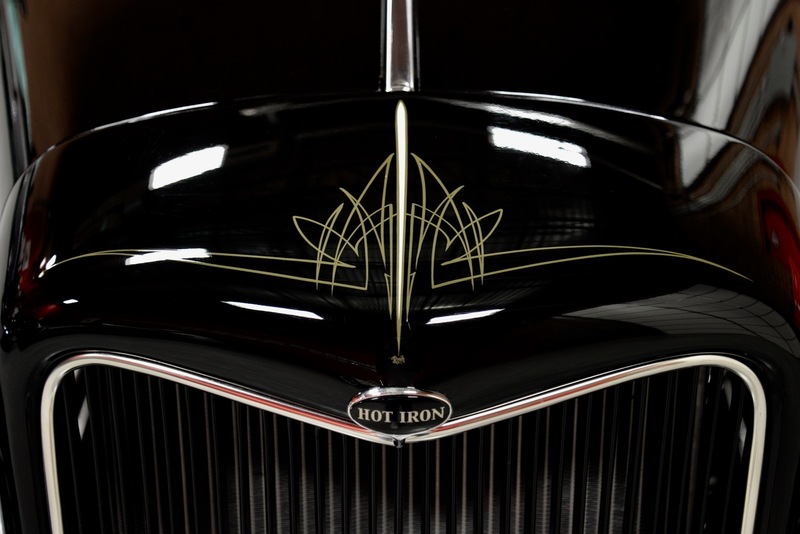 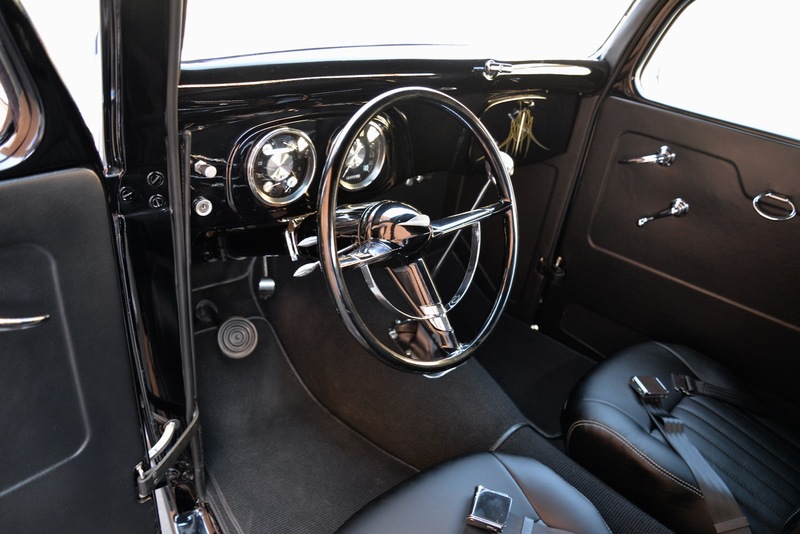 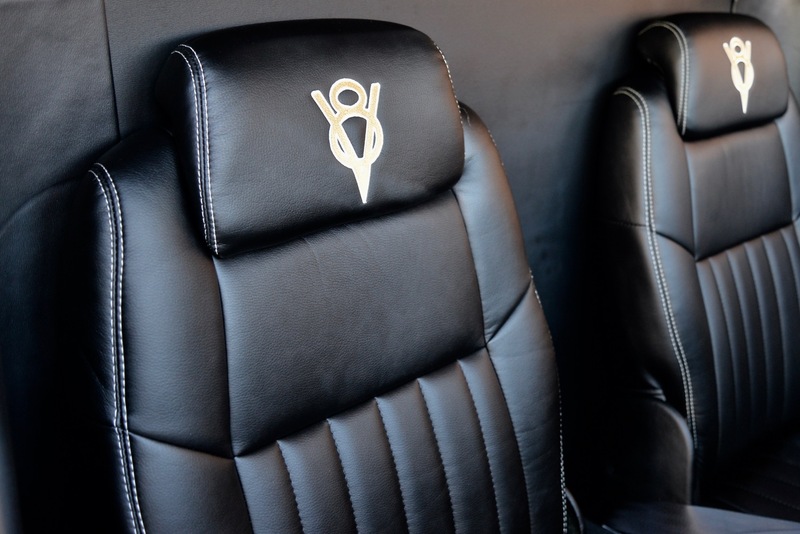 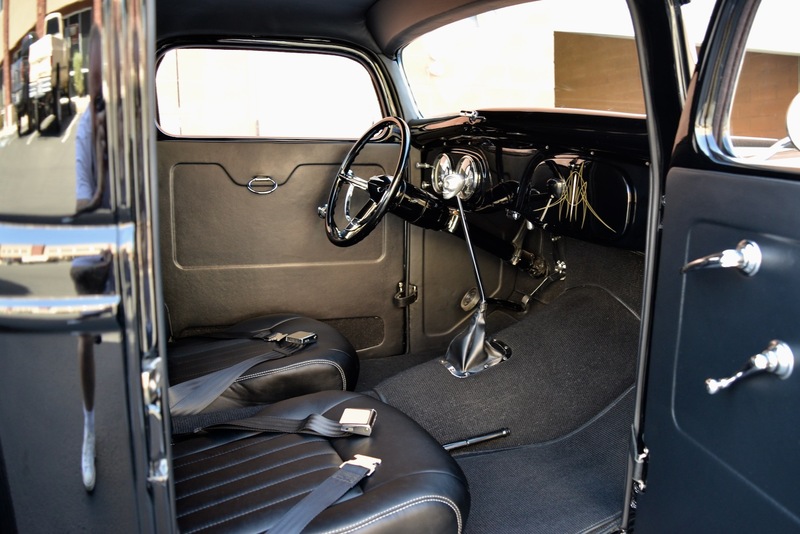 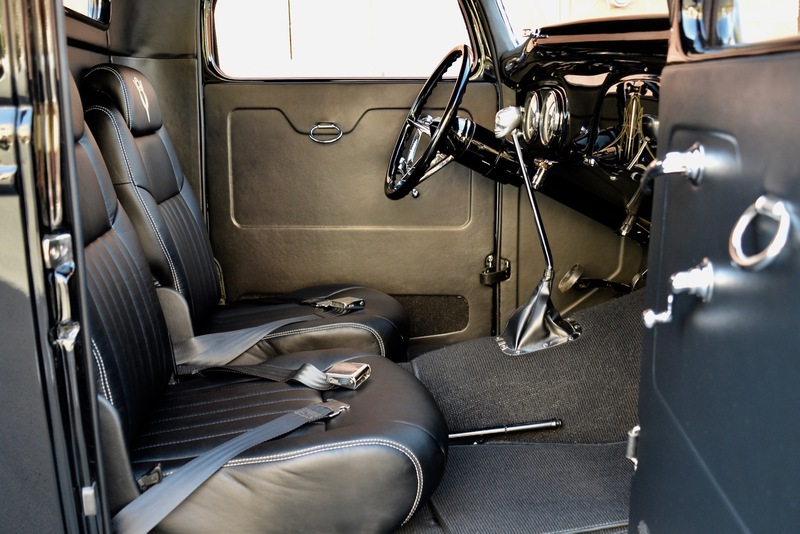 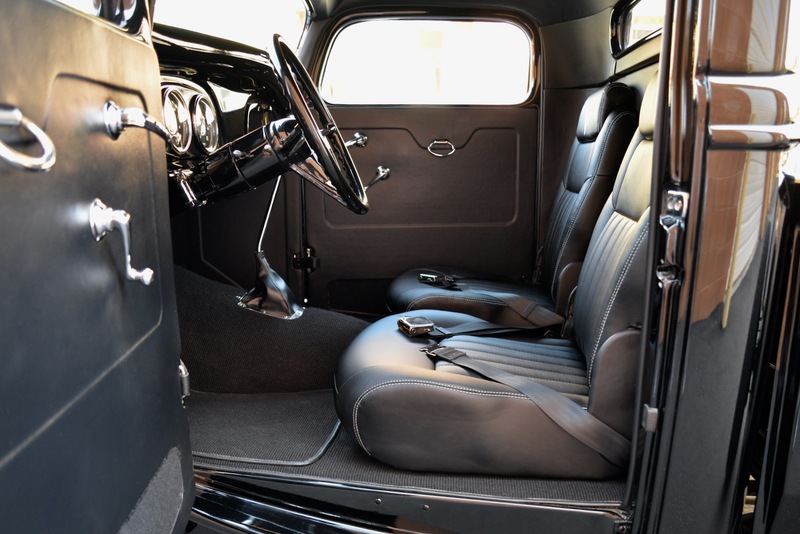 Open the driver’s door and you will find an absolutely pristine custom black leather interior that was designed to have that vintage Hot Rod look, but still be extremely comfortable & functional. 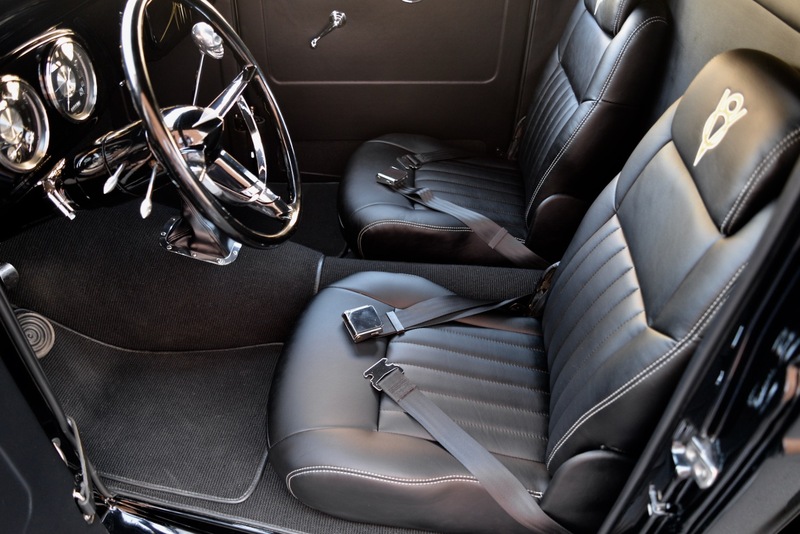 Interior features include: custom leather bucket seats w/ V8 logo, black wool carpeting throughout, black vinyl door panels w/ black wool inserts, matching black vinyl kick panels & head liner, 16” Lokar shifter w/ steel skull shift knob, GM tilt steering column w/ smaller 15” 1955 Chevy steering wheel, Classic Instruments gauges, power windows operated off of vintage window cranks, functional tilt-out windshield, and black seat belts on both sides. 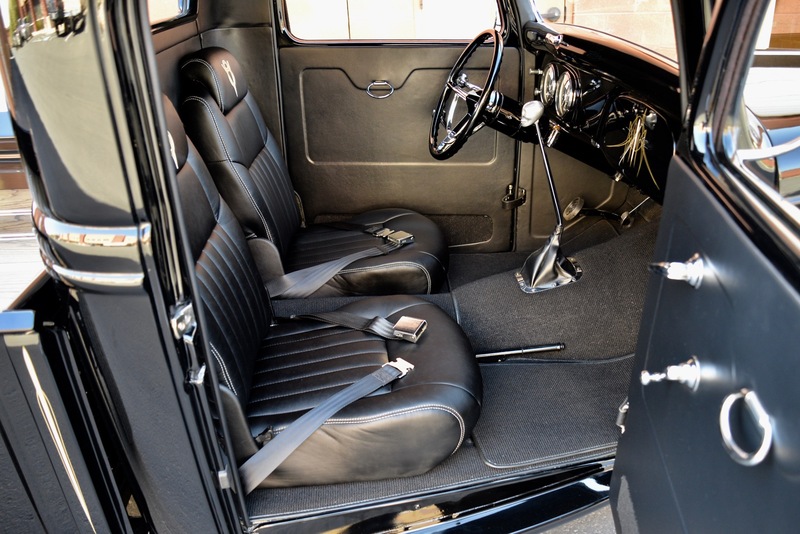 The tasteful & ultra-clean design of this interior could not have come out any better in my opinion. 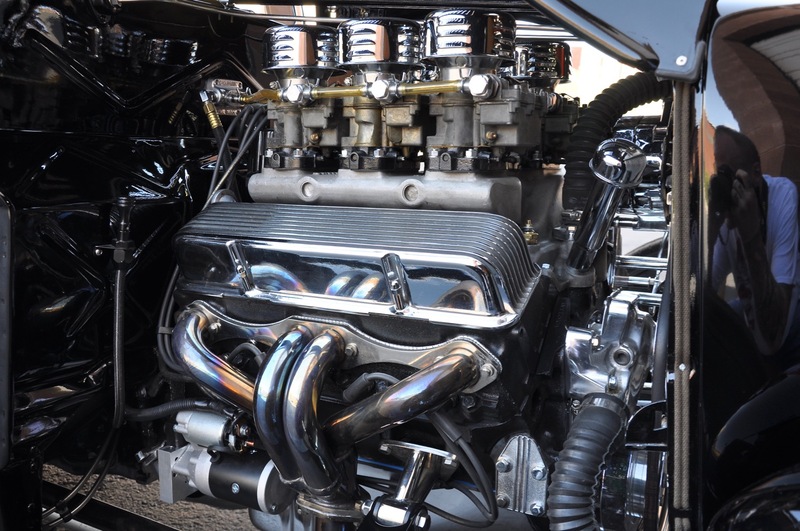 I am 6’2” & 210 Lbs. 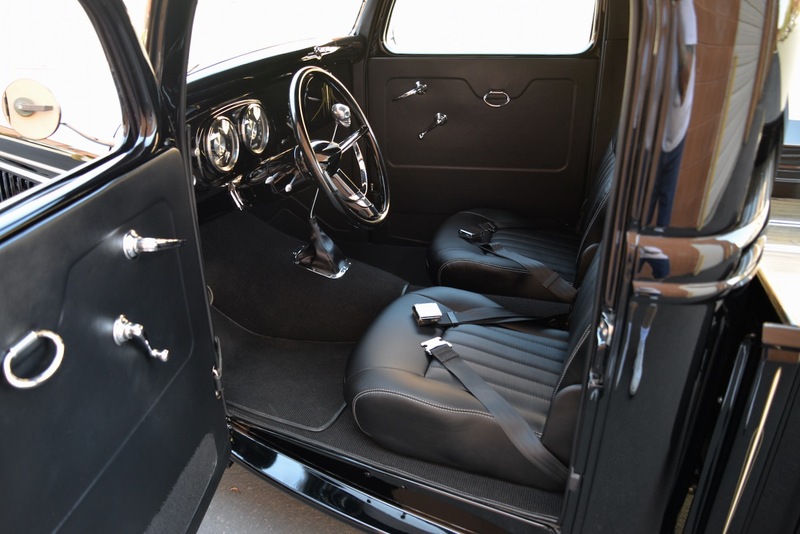 and I fit comfortably with plenty of room to spare. 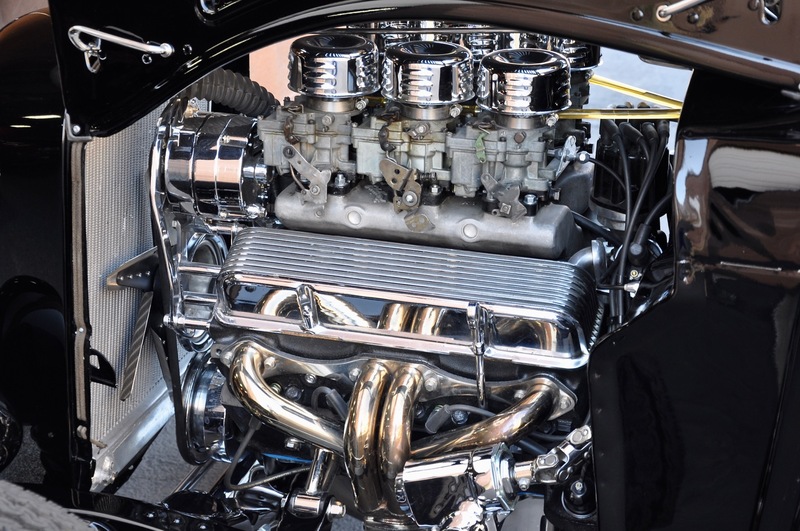 When you walk up front & open the hood flaps, you will find a custom-built 350ci SBC motor dressed up in vintage Cal Custom finned valve covers and topped w/ a true vintage Edelbrock racing intake manifold w/ (6) Rochester 2-Jet carburetors, along with a chrome alternator, chrome steering box, & chrome pulleys. 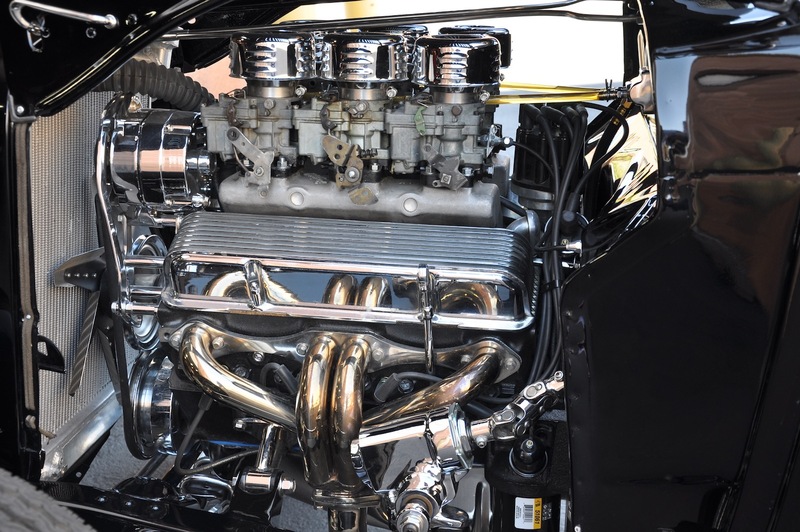 The 350ci SBC is linked to a completely rebuilt GM Turbo-Hydramatic 400, which feeds power to the 10-Bolt rear end w/ 3.42 gears. 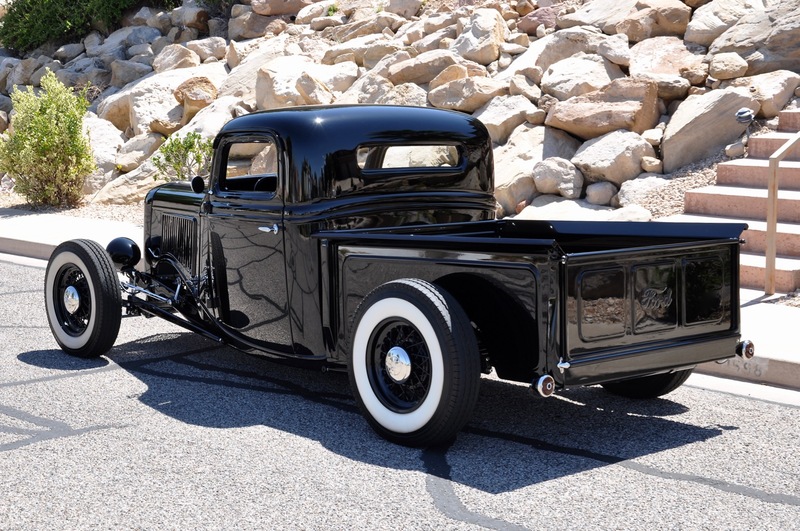 She fires up w/ a flick of the wrist, settles into a nice smooth idle and when it’s time to go, let me tell you she goes! 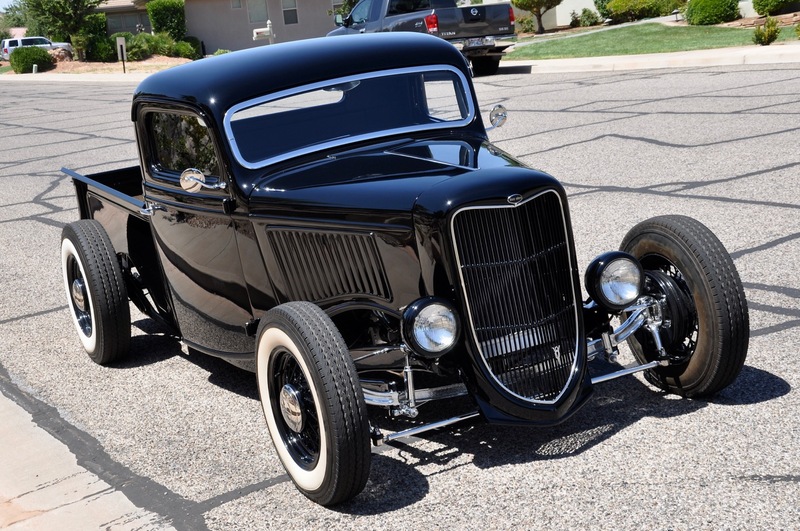 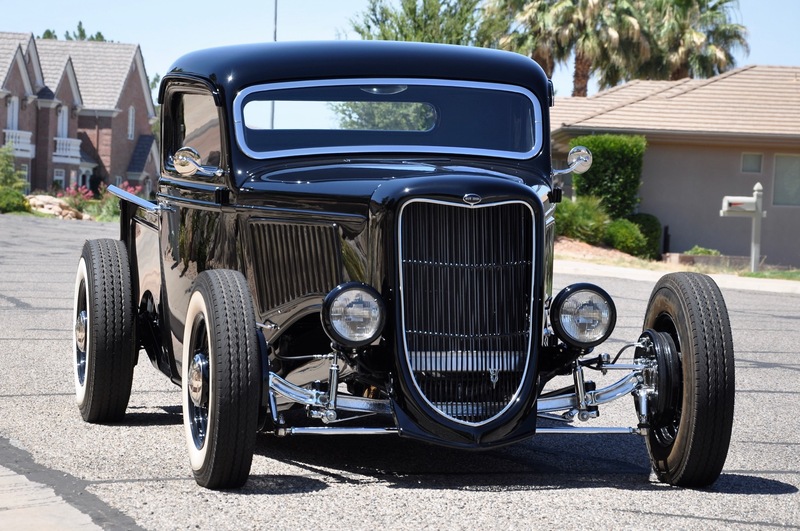 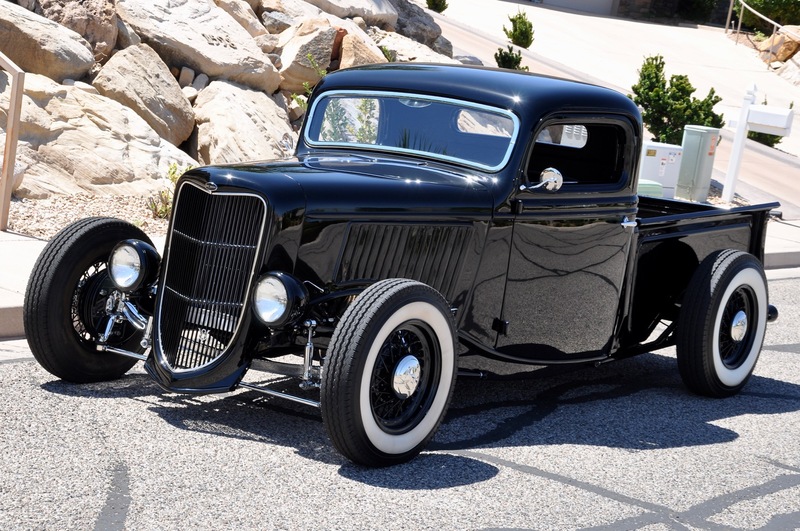 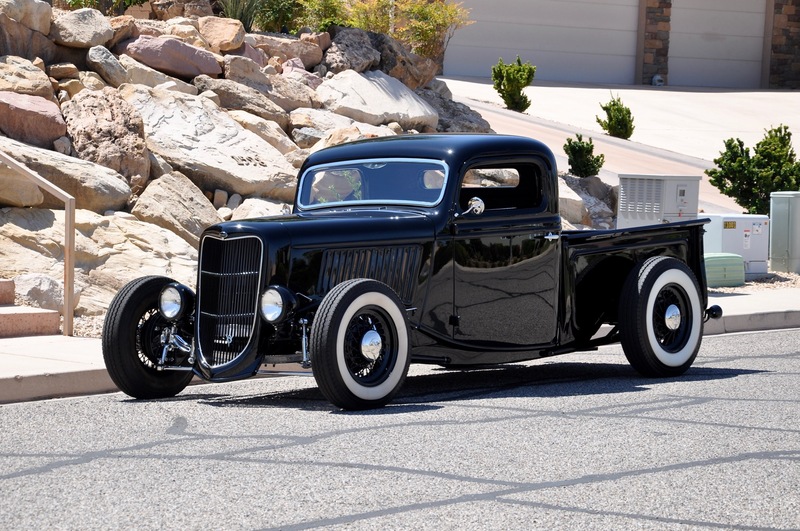 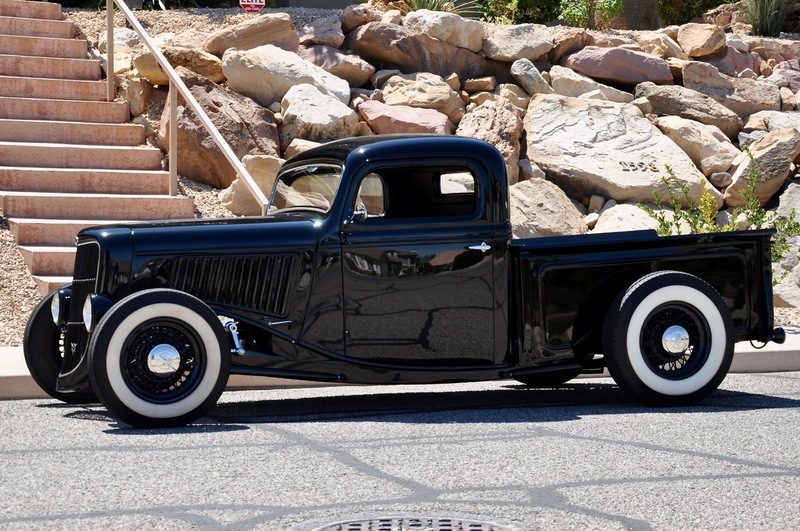 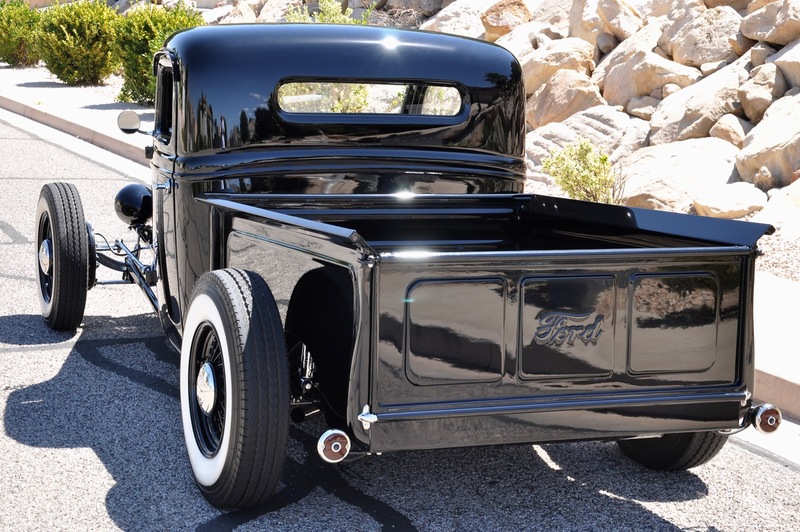 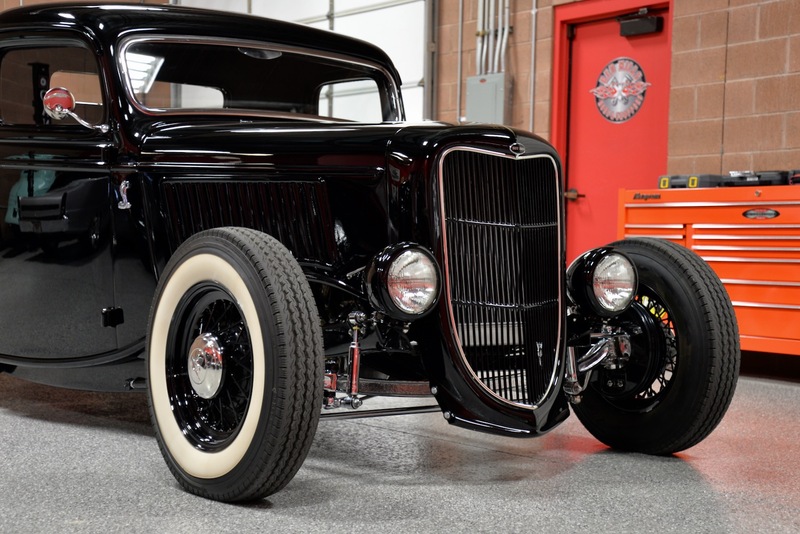 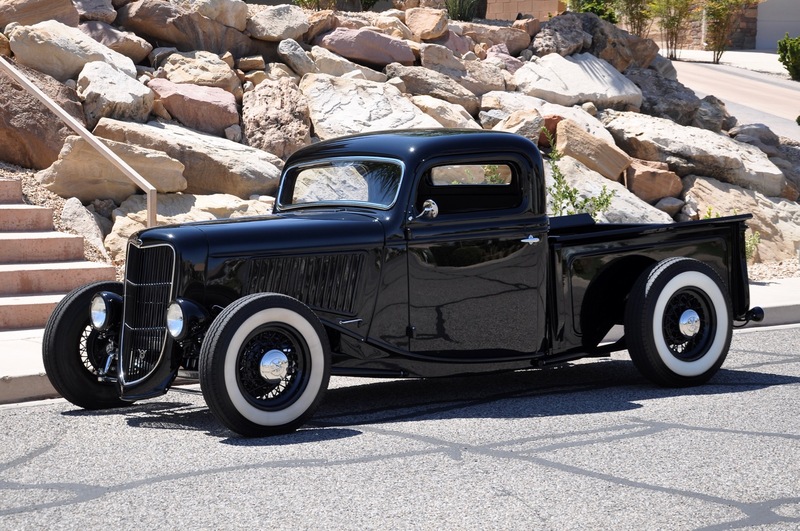 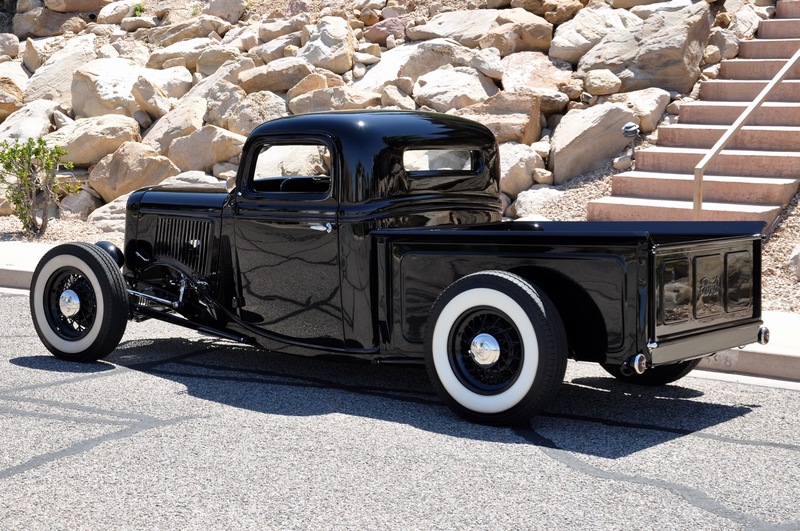 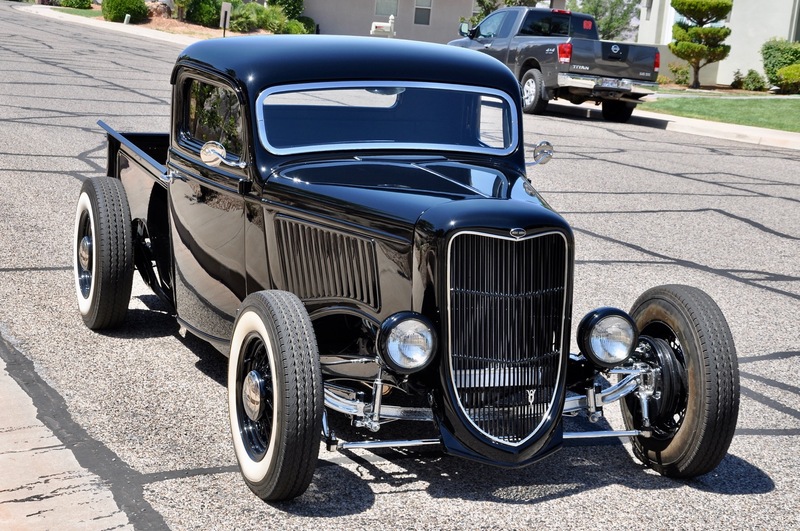 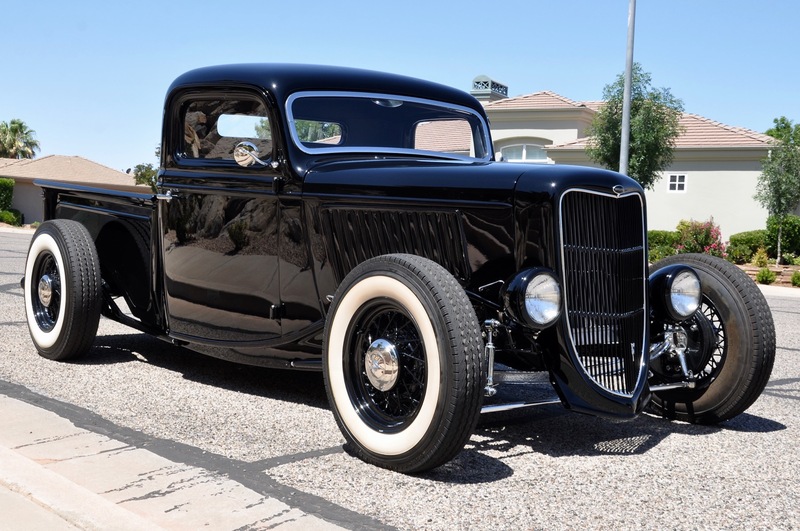 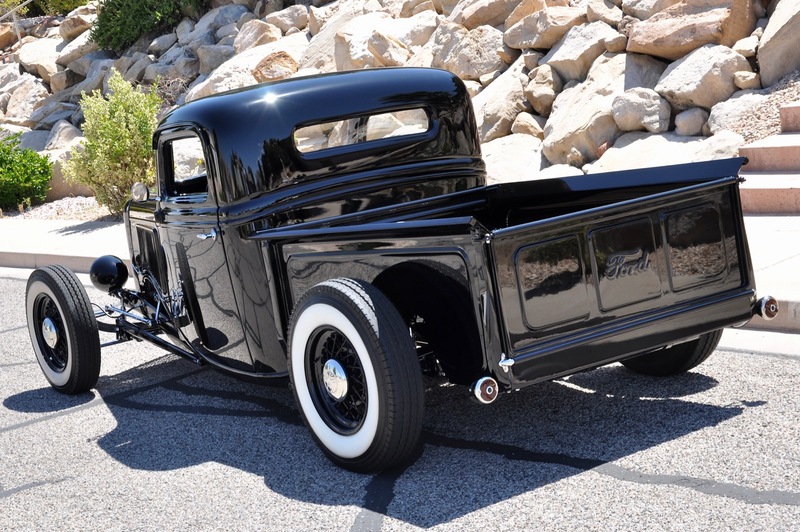 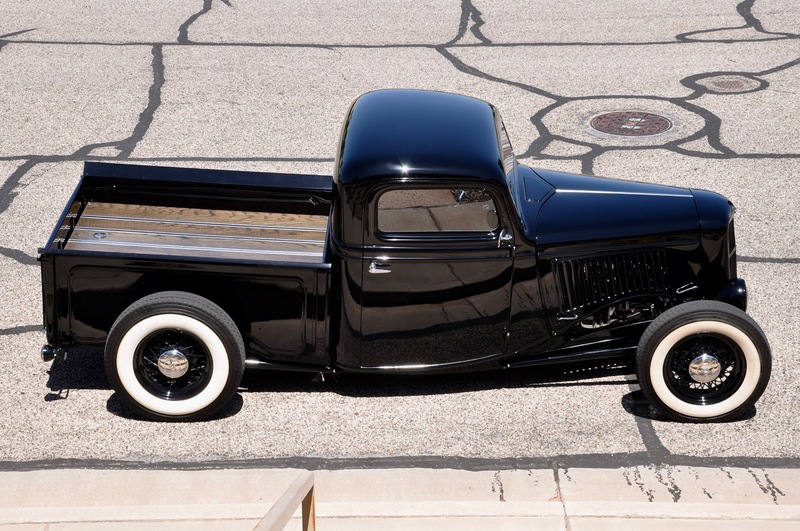 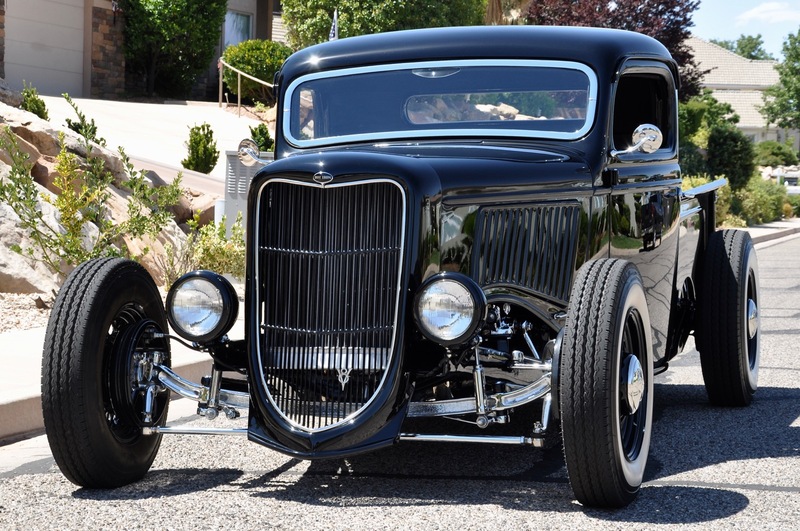 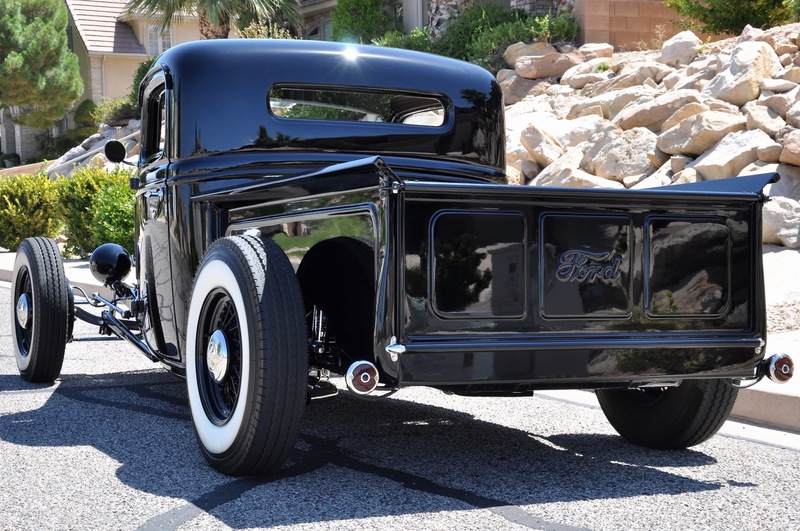 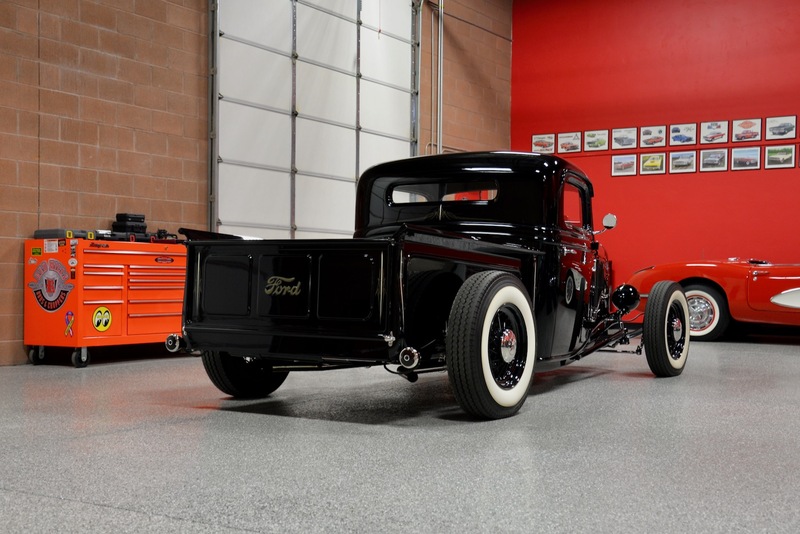 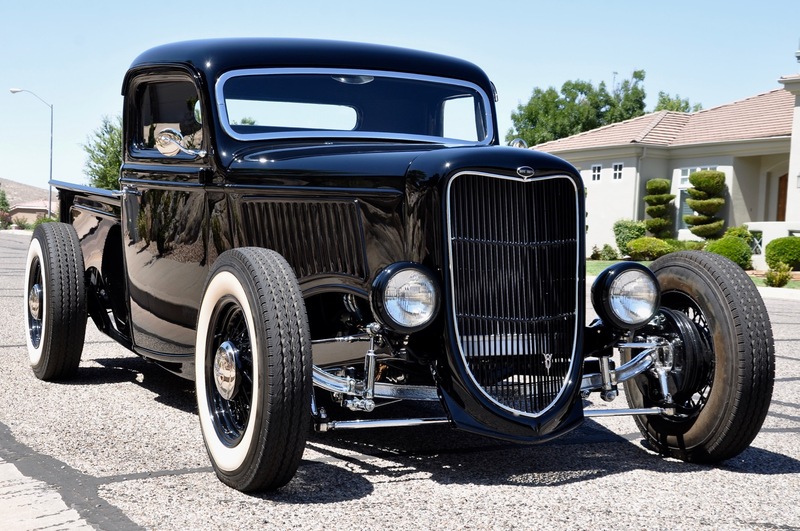 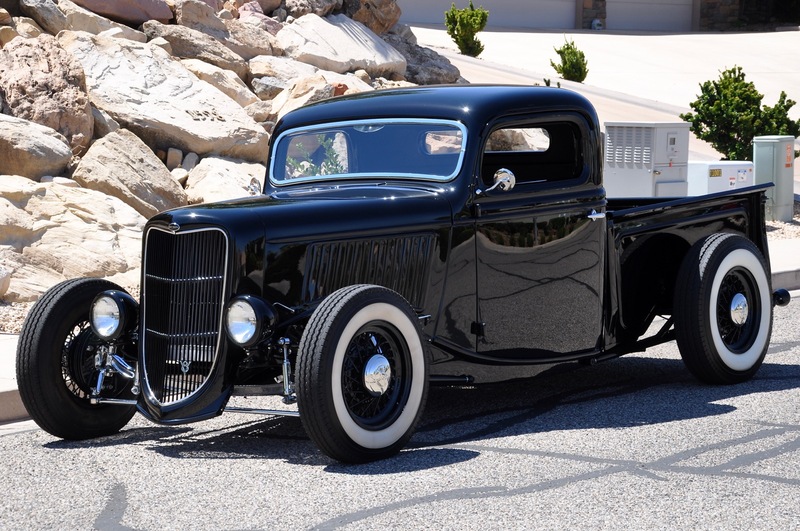 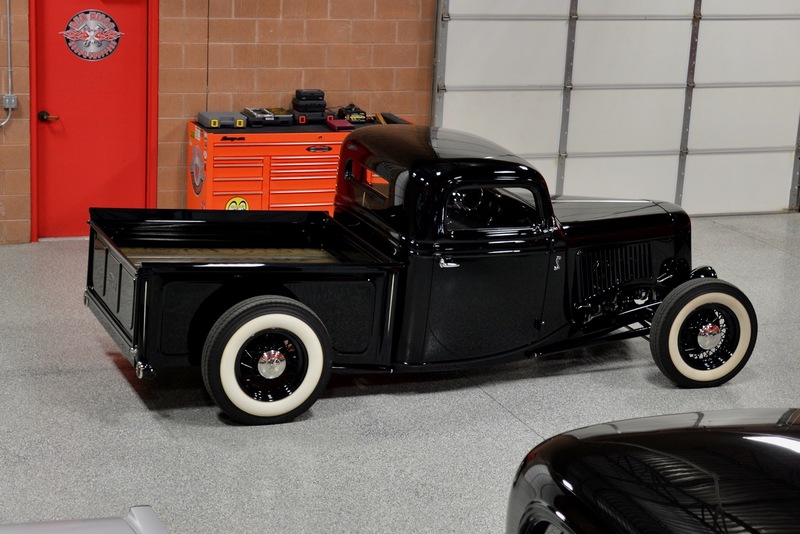 This ’36 Ford Hot Rod Pickup runs, drives & performs beautifully in every way! 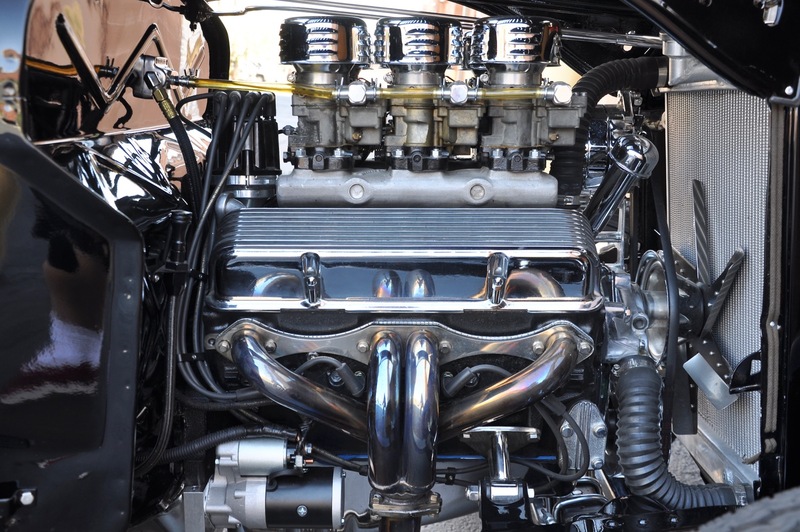 I was amazed at the power & torque that she delivered, as it pulls hard through all three gears. 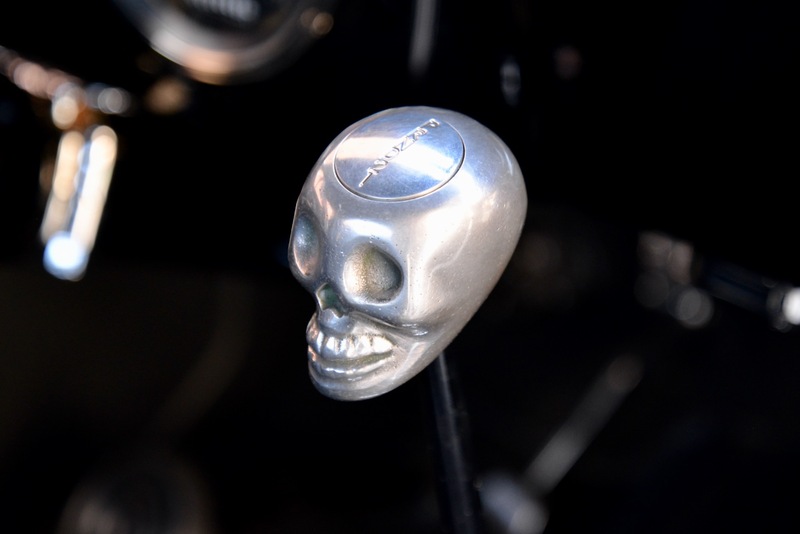 The shift is strong by still nice & smooth w/ no strange sounds or noises. 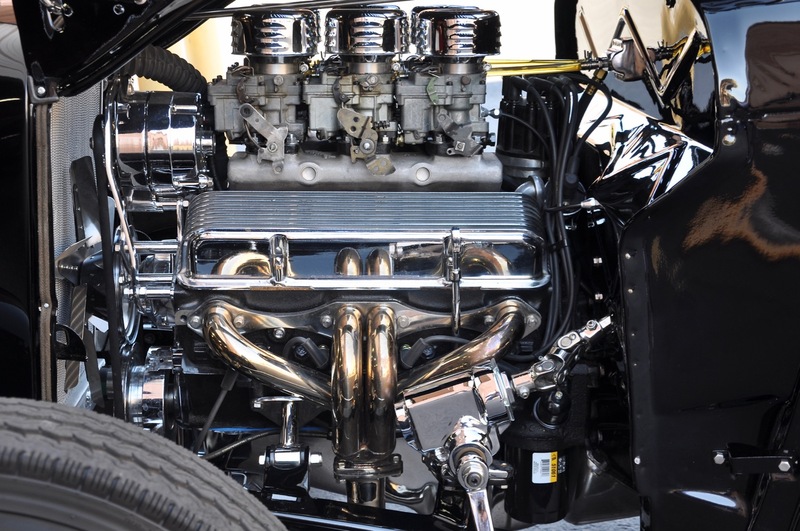 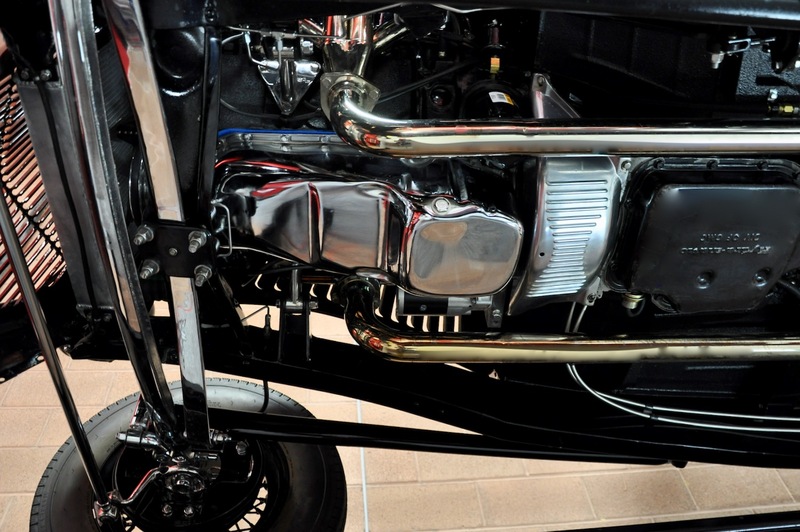 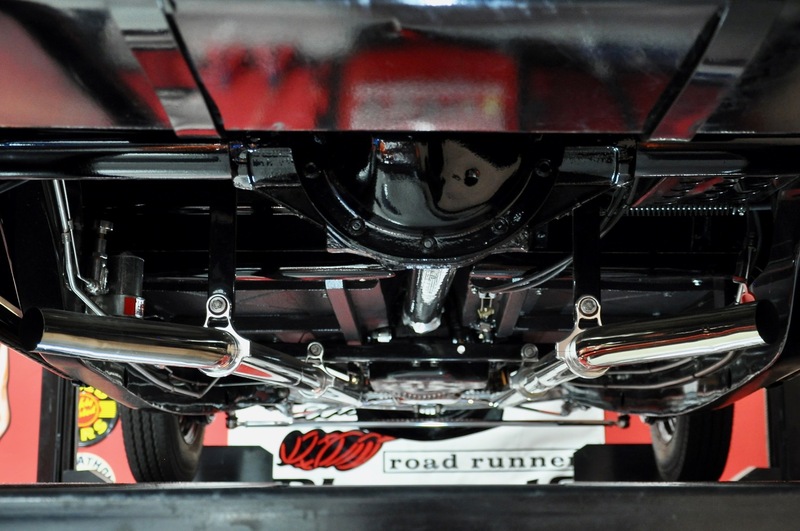 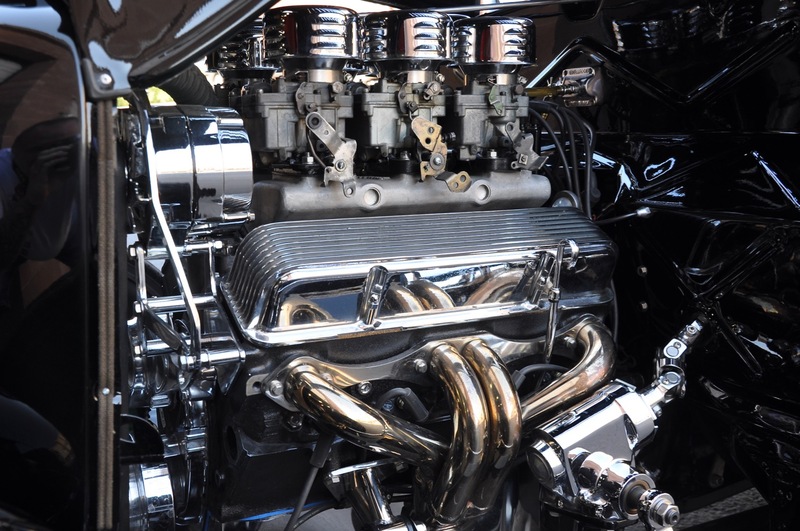 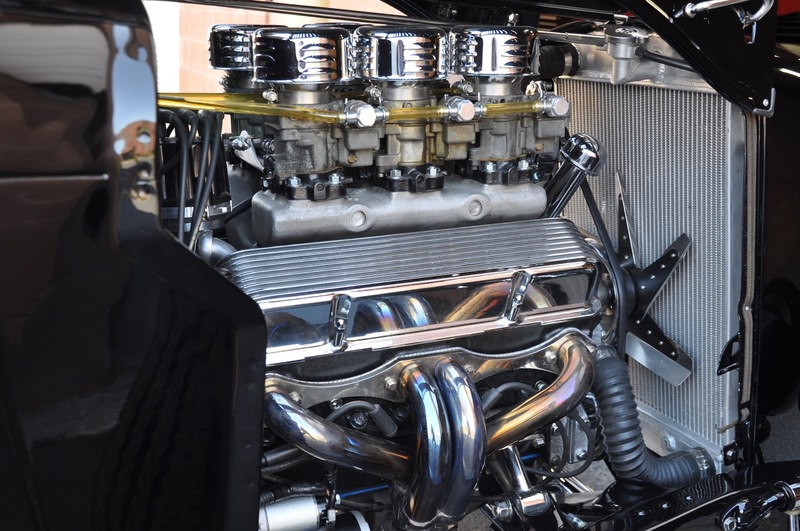 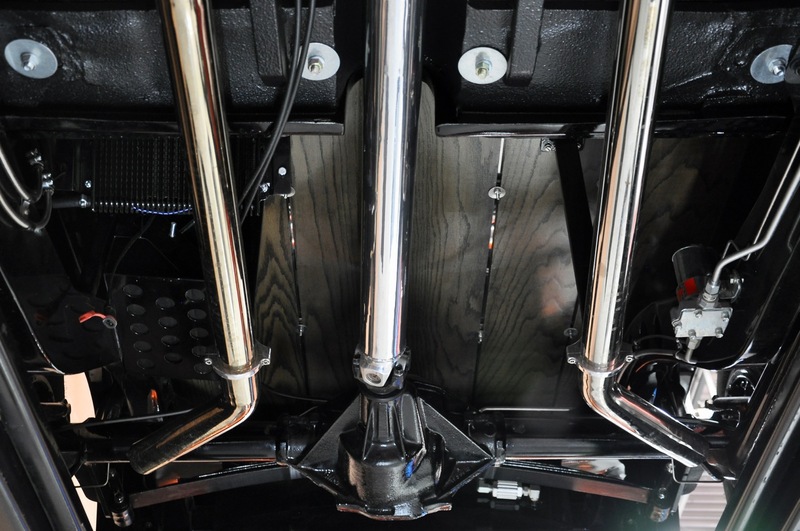 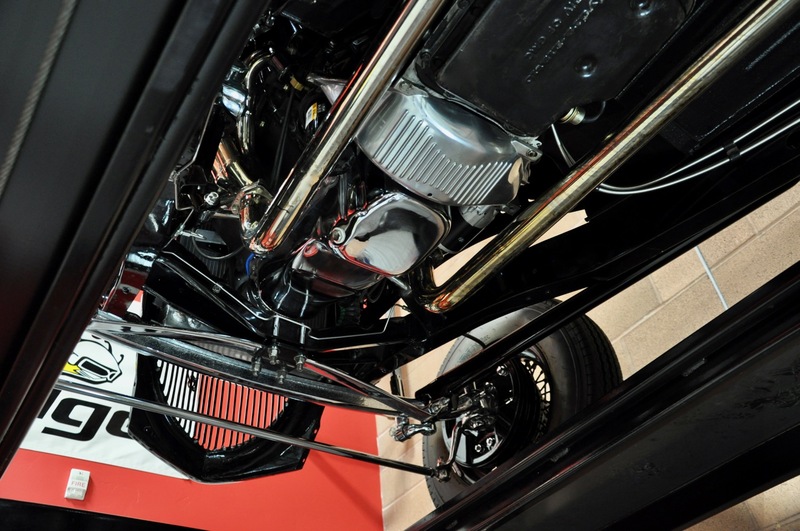 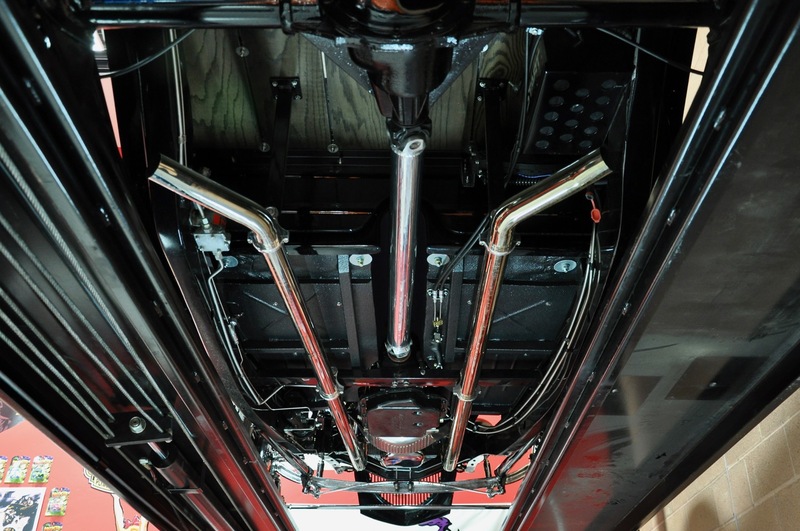 The custom stainless steel headers & hand-built polished stainless steel exhaust system sounds absolutely incredible! 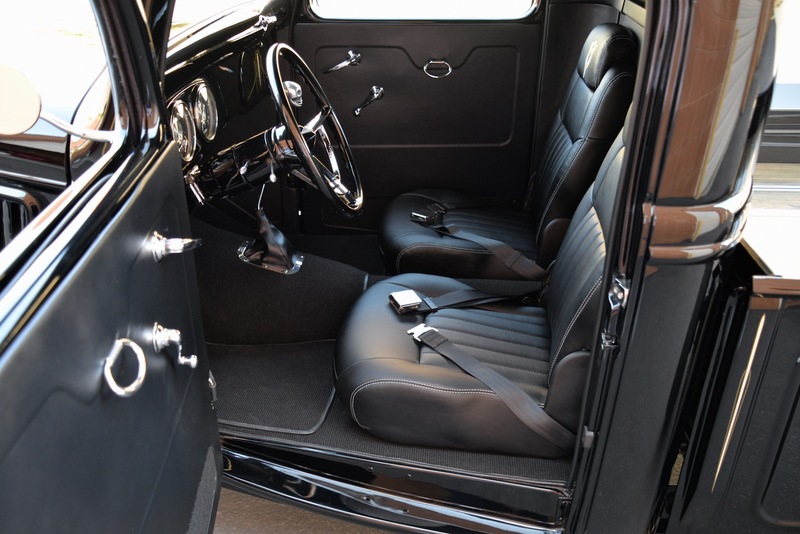 The ride is extremely smooth w/ no rattles or unwanted vibrations whatsoever. 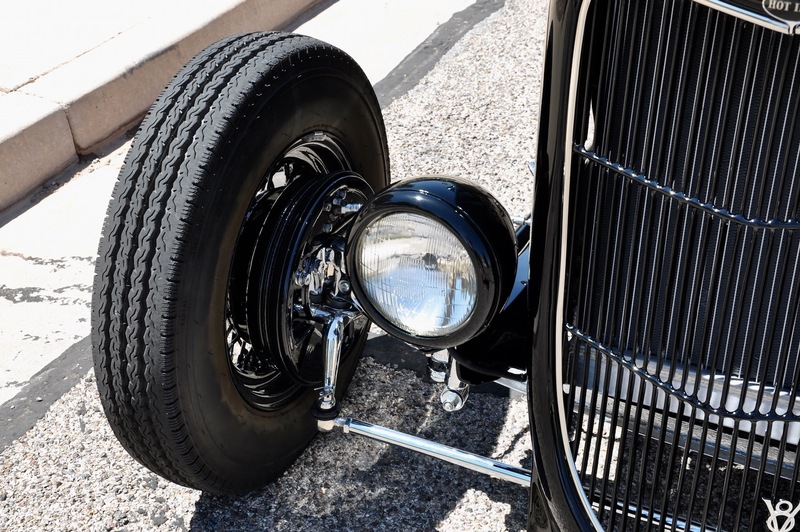 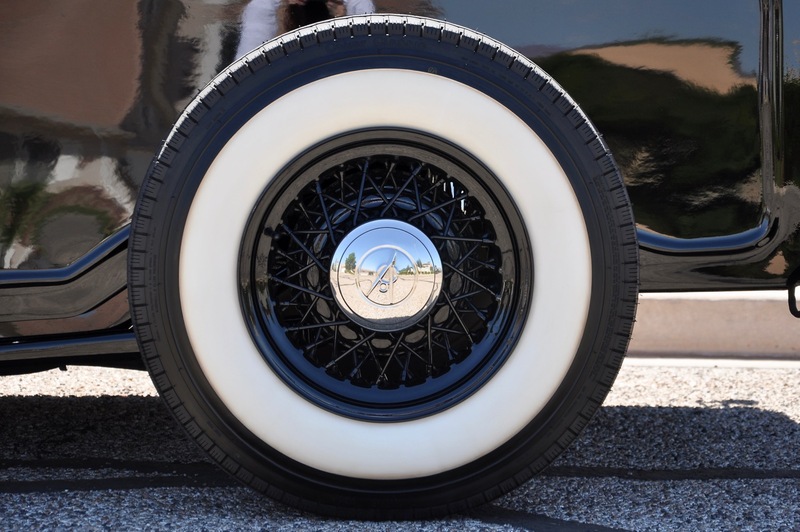 Driving around town is effortless, and when it was time to get on the highway, it tracked straight & true w/ no rattles or shakes. 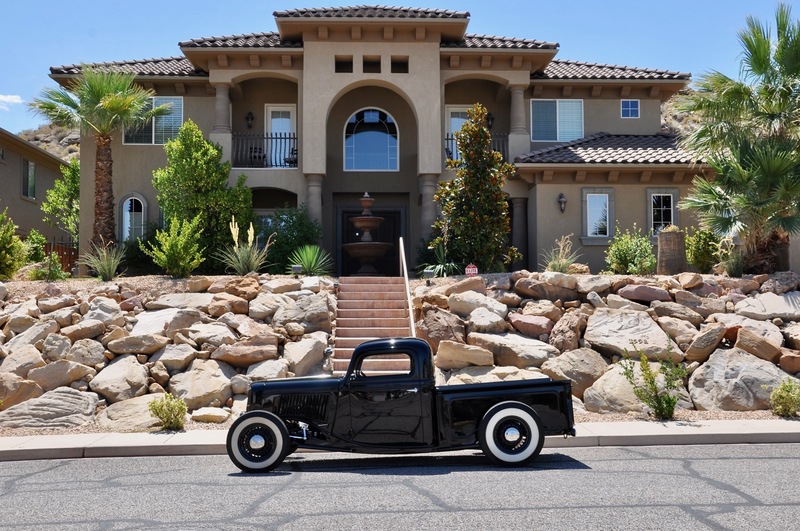 The aluminum radiator w/ thermostat controlled fan keeps it running nice & cool even in the hot desert weather! 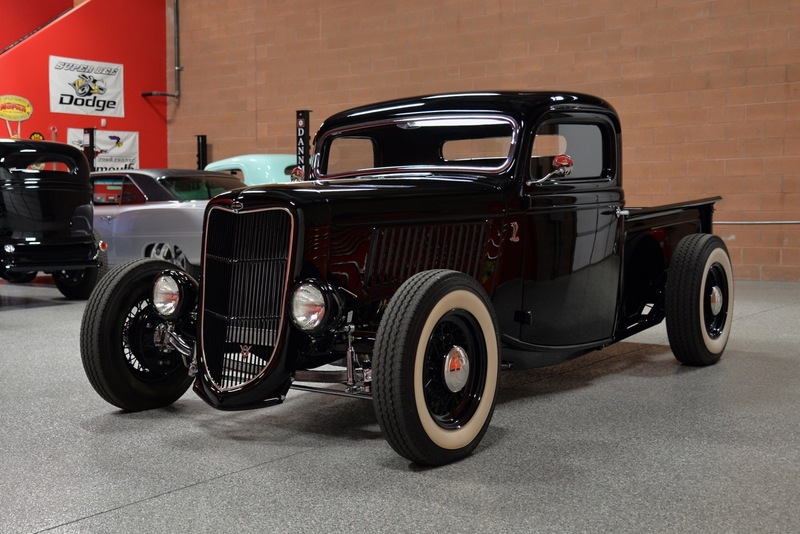 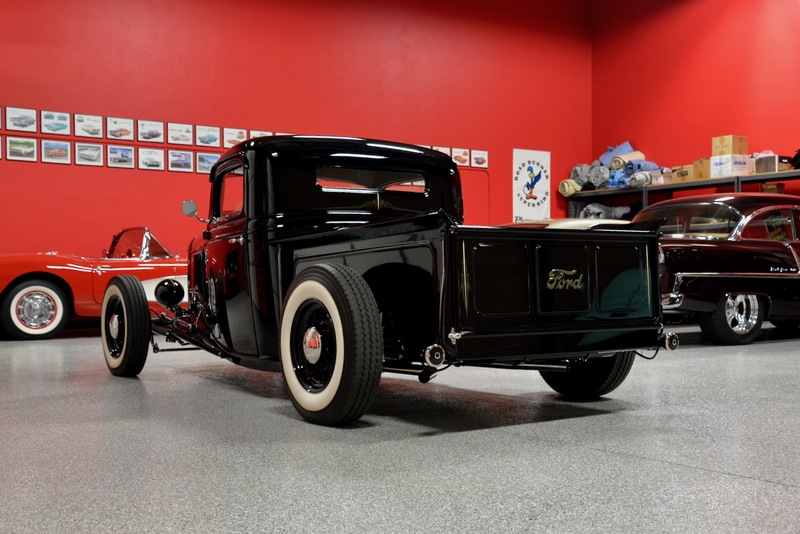 Whoever ends up w/ this amazing 1936 Ford Hot Rod Pickup is getting a Street Rod that is guaranteed to win First Place trophies at any national level car event, but can also be driven to and from the show without any worry about reliability. 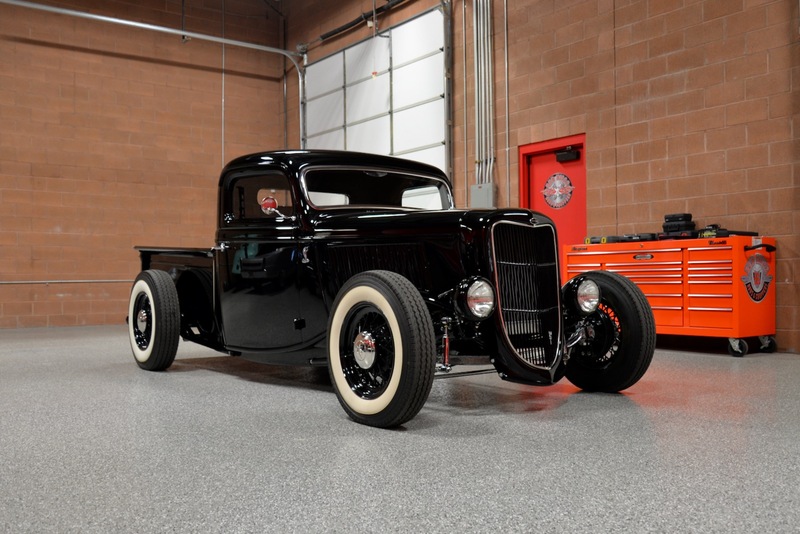 With less than 50 test miles since the completion of the build, you are basically getting a brand new 1936 Ford Pickup with zero wear! 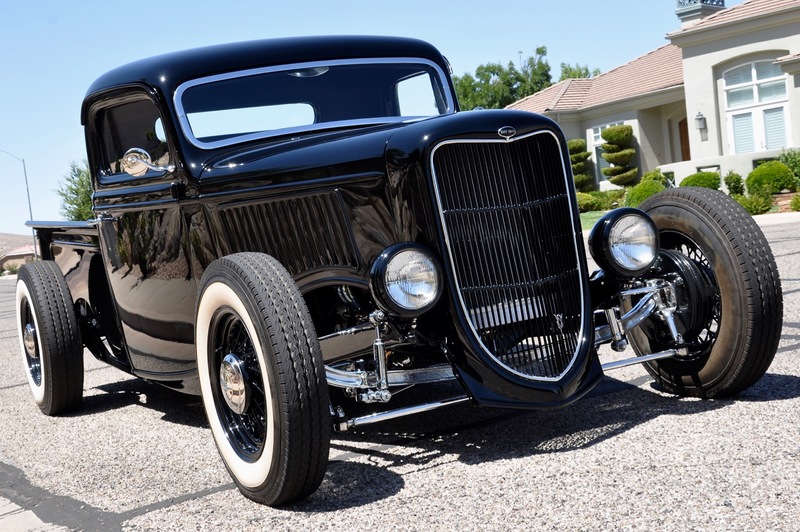 A lot of thought & love went into building this gorgeous machine, which is immediately apparent the minute you lay eyes on it. 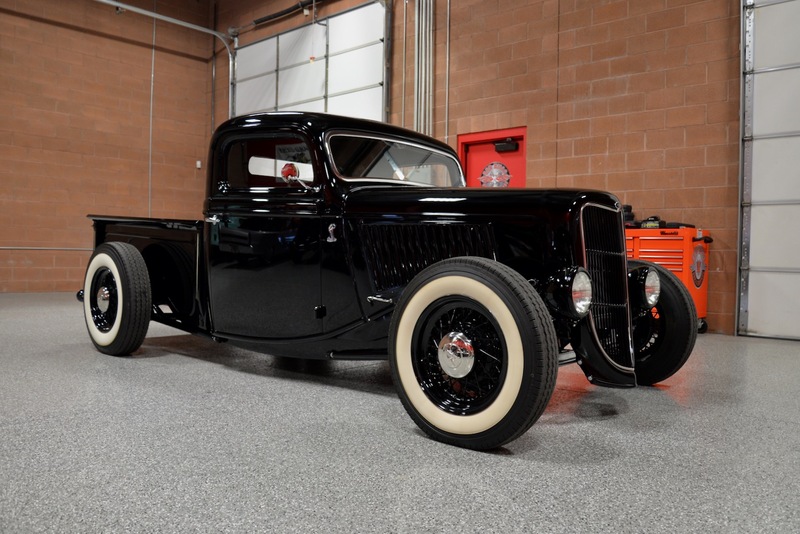 If you have been searching for a high-quality old-school Hot Rod truck that will separate you from all of the others, you have found your truck!